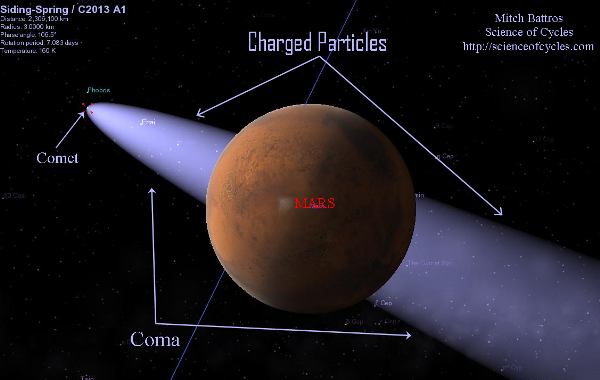 Mars’ atmosphere was very much like Earth’s – that is until an interplanetary collision occurred ripping its protective magnetic field away. However, some managed to remain after the event, additionally; current seasonal climate change continues to produce upper atmospheric plasma which is in fact charged particles. 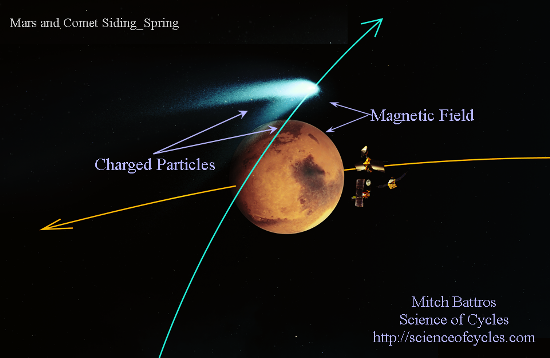 Comet Siding Spring is also surrounded by a magnetic field as a result of solar wind interacting with plasma generated in the coma, which is the large mass we see as a gaseous cloud. Comet Siding Spring’s nucleus, as are all comets, just a tiny asteroid with remaining ice. In this case, its nucleus is approximately .3 miles (.5 km) in diameter. However, the coma, as with all comets, stretches some 600,000 miles (1,000,000 km) in distance. As a result of Earth’s magnetic field weakening with increasing amounts each year, it is time to reconsider the effects of NEOs (Near Earth Orbits). Comets create their own atmosphere by outgassing which contributes to its generating of charged particles. What is less known, is that although asteroids do not have an atmosphere, they do retain predominantly positively charged cosmic rays. They would mostly burnout during entry through Earth’s atmosphere, but as we know, the large ones make it through. But it is time to recalibrate. Due to a weakening magnetic field, it might be wise to view the small guys with a little more interest and be a little less ambivalent when we hear the newscaster say in their jocular playful manner: “hey, did you hear about the near miss we had last night….